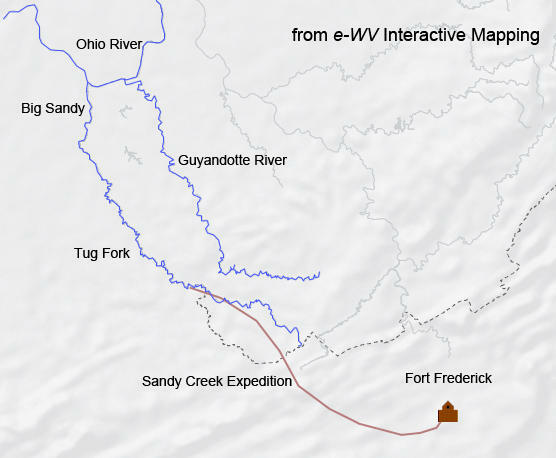 On March 13, 1756, the beleaguered Sandy Creek Expedition came to a halt. The French and Indian War campaign had been initiated by Virginia’s governor in response to Indian raids in the New, Greenbrier, and Tygart valleys. In the most famous of these raids, Shawnee Indians kidnapped Mary Draper Ingles, who later escaped captivity and walked hundreds of miles back home. In retaliation, the Virginians planned to attack Shawnee villages in Ohio. Major Andrew Lewis amassed more than 300 men, including nearly 100 Cherokee Indians. They started out in February 1756 and made their way into present McDowell and Mingo counties. But the operation was doomed almost from the start due to harsh weather, swollen streams, and inadequate provisions. Supplies dwindled quickly, and flour rations were cut in half. Making matters worse, the lack of wild game pushed the men to the point of starvation. On March 13, Lewis pressed the group to continue, but fewer than 30 were willing to push on. The campaign ended in utter failure. Although, the expedition did achieve one thing by strengthening ties between the government of Virginia and the Cherokee Nation.